Fully revised and updated... and now with ZOOM system for even better orientation! Marco Polo maps feature completely up-to-date, digitally generated mapping. The high quality cartography with distance indicators and scale converters aid route planning. New ZOOM System - all large urban areas are marked on the main map and are cross-referenced to separate inset transit maps which zoom in on the city to aid route planning. 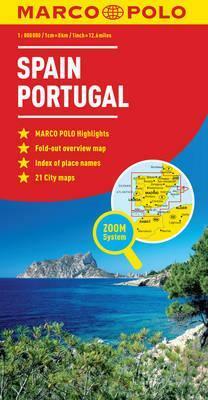 We then zoom in further to detailed city maps which can be found easily in the separate index booklet. Includes city maps of: A Coruna, Alacat - Alicante, Barcelona, Bilbao, Coimbra, Cordoba, Donostia San Sebastian, Gijon, Granada, Las Palmas de Gran Canaria, Lisboa, Madrid, Malaga, Murcia, Palma de Mallorca, Porto, Salamanca, Santiago de Compostela, Sevilla, Valencia, Zaragoza. Major sights and key points of interest are marked on the map by numbered stars and these are listed in the index booklet with a brief description to help travellers pick the best places to see en route. Comprehensive index. The map scale is 1: 800 000.